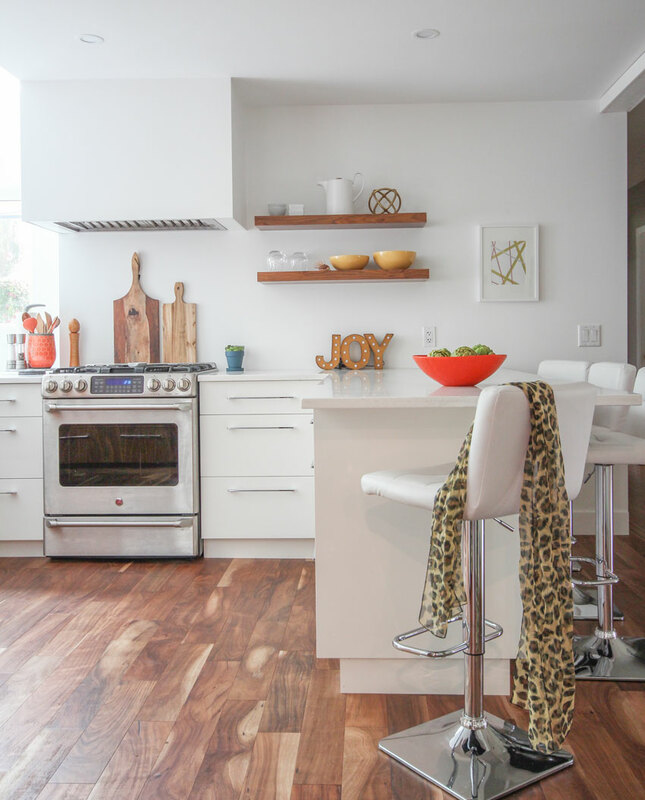 Our kitchen renovation reveal is finally here! Approximately 3 years ago, we started the renovation on our rancher-style home where we added a garage, created a larger laundry room with a side door entrance, extended our kitchen out into the backyard and renovated the main bathroom. Let’s just say the renovation which took months of hard work, sweat equity and patience did pay off. We are so happy with the end result and if you live through your own renovation, that is something you have to keep reminding yourself of. The months of disruption that you experience during the renovation is mostly forgotten when you are enjoying the end results of your dream kitchen or living space. And it truly is our dream kitchen. If you want to appreciate how far it has come, here are some before photos. It all started with us having drawings done by Mitchell Baker, owner of Karnak Pro Builders in North Vancouver. 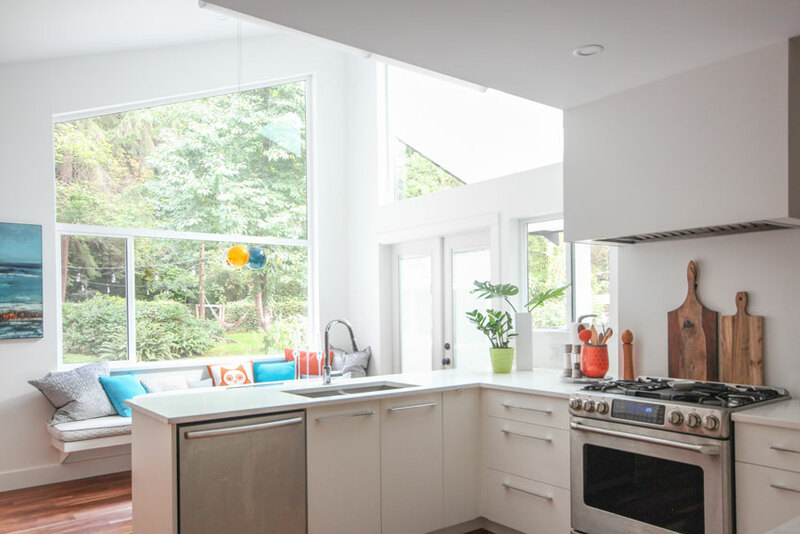 He envisioned a kitchen with a view of the forest behind our house, building with the original pitch line of the existing roof to create a grand indoor/outdoor living area that provided ample natural light. Our designer friend Christina James helped us create the layout of the kitchen cabinets after I shared with her the look and feel that we wanted in the kitchen work zone. The collaborative result is a light-filled kitchen that’s perfect for entertaining with friends and family, as well as a place to enjoy a morning coffee. For more photos and to read the blog that my designer friend Maria Killam wrote about our renovation, click here to go to her blog post. To view more of my work, browse my Interior Design and Decorating Portfolio. For more inspiration and behind-the-scenes photos, connect with me on Facebook! My client’s family room had a red brick fireplace that dominated the space and she wanted a change. Because of the odd size and the lack of a mantel, the fireplace seemed out of place and unfinished. And since the client wanted to upgrade to a remote-controlled energy-efficient gas insert, this was the perfect time to redesign the fireplace surround. A full fireplace renovation was in order. In the end, she wanted her fireplace to complement the look and feel of the rest of her home that we had updated and transformed over the years. A fireplace is always a focal point in any space. When choosing fireplace design materials, there are a few considerations: the overall aesthetic that the client preferred, the style of the home, and proper scale of the surround. What will hang above it (if anything) is an additional consideration, whether it’s a TV or decorative objects such as a mirror or artwork. For the fireplace surround, we decided on a light, neutral tone ledgestone tile from Julian Tile. The contractor, Vaile Long from All the Right Angles, did a fabulous job rebuilding the fireplace frame and tiling the surround. I suggested that we create a built-in cabinet on one or both sides of the fireplace surround and the client opted to go with a built-in on the left side only since she already had a freestanding sideboard on the right side. We talked about our options for the wall above the cabinet and whether we should design a full height box with shelves, have floating shelves or leave the space open for a large piece of art. In the end, we decided on floating shelves so my client could use the space to display photos, art, accessories and books. The custom cabinets were built and installed by troico, based out of Coquitlam, BC. They really did an excellent job with the finishing of the cabinet and shelves. The client especially appreciated that they scribed the cabinet to the ledgestone tile of the fireplace surround. To keep the wood tones similar, we specified a close match of the wood stain colour for the mantel and the cabinet top from the client’s sideboard, and from the wood flooring. Years ago we had selected the wall colour, Dry Sage by Benjamin Moore, and the client still loved it so we left it as it. We wanted the space to feel fresh and up-to-date while maintaining the style of the finishes to have a subtle nod to traditional roots. The medley of the white painted wood, the rich wood tones, and a classic stone finish accomplish just that. Speaking of renovations, you’ll also want to check out how we transformed our outdated bathroom into a modern spa. Want even more interior decor inspiration? Follow me on Instagram! Wallpaper today is not your grandma’s wallpaper. It’s now trendy to use wallpaper as a way to add style to your home in a way that’s unique and pretty cool. Recently I helped a client find wallpaper for their downtown condo. The boring builder’s white walls did nothing for this modern space. We looked through several wallpaper books and our final selection was quick and decisive because they just seemed perfect for the space; a zigzag pattern in metallic soft gold for the bathroom and a wide horizontal stripe for the hallway and living room. Once we selected the wallpaper, we matched a paint colour for the other walls. Wallpaper has been ordered, received and ready for installation! In the living room, we decided to do a feature wall and chose the wall behind the sofa to be wallpapered. In the bathroom, all the walls were wallpapered to give it a dose of oomph. And the long wall in the hallway needed some drama which is exactly what the wide horizontal stripe wallpaper does to this space. The client really liked how the wallpaper transformed the look and feel of the condo. The wallpaper defines the various areas in the small condo and personalized them. What do you think? Are you looking to add some style to your condo? Check out our Instant Aesthetics e-design package where you hire us to help you do up one room in your home. It’s that simple. Recently, a long-time client of mine woke up to flooding caused by a burst water pipe in an upstairs guest room. Although much of the damage was confined to the guest room, water also flooded into the rooms below, affecting family room, living room, dining room and kitchen. I have worked with this client since 2005, assisting her to choose paint colours for her whole home, and select and purchase custom furniture, window treatments, light fixtures and other décor accents. Our professional relationship proved very useful during this stressful event. Below is the redecorated family room with new silver drapery hardware from JF Fabrics, drapery panels made with fabric from Maxwell Fabrics, and new wall colour from Benjamin Moore Paints CSP 830 Peaceful Garden. Insurance and restoration companies often aren’t staffed with decorators who are experts in design, fabric, paint, and how to oversee the making of custom pieces that reflect a homeowner’s style. My client suggested to her restoration company that they bring me on board because she knew I could make sure that the items that needed to be replaced would be of the same quality as those we had originally installed. She also knew I had her information on hand, had her style in mind, and could supply the original purchase paperwork to make this process faster and smoother. For example, years earlier we had chosen a beautiful light fixture with a lovely amber shade, and my client wanted to replace it when it was ruined in the flood. I still had the product code and contacted the light company to reorder the same style and the same colour. The salesperson confirmed the product via catalog photo and model number. I was assured the same fixture was on its way. However, after almost six weeks of waiting, the fixture arrived and the “amber” shade was actually a reddish colour! Also, the size of the crystals was different (see photo below – original crystals on the right). The numbers matched, but the product had been revised and the original amber colour was no longer available. I handled the situation by returning the fixture and taking my client shopping to find a new light that she loves. Situations such as the light fixture can be hard to for a homeowner to handle on their own. It can be difficult and stressful to deal with wholesale companies or manufacturers when something goes wrong. I can handle the stress and deal with the bumps in the road for the homeowner. I have professional relationships with furniture and design companies and their salespeople. I’ll visit the workrooms, check on the fabric, re-order and re-do things on behalf of my client. I can help speed the restoration and redecoration process so that a client isn’t living with dust and grime for what can feel like forever. It comes down to having a history of experience with my clients and connections in the decorating business that representatives from a restoration or insurance company just won’t have. Working with the same professional decorator over time also assures that when something is redesigned, due to a change in preference or an unexpected problem such as a burst pipe, it’s easy to keep elements of the previous design and refresh other parts, such as paint colours or window treatments, to update a room. We were able to do that in the guest bedroom. Originally the walls were yellow and had no drapery panels. Now the walls are BM AF 515 Exhale (ironic don’t you think?) and match the drapery panels that were moved there from the master bedroom. When designs are classic and true to the style of the home, updating here and there is much simpler. And it’s exciting for me as a decorator to see how a client’s style can change over time. If mishap does happen, be sure you know your insurance contacts, and consider hiring a professional like myself to save you time and stress in the recovery period. I wish you a happy and prosperous 2015, and may all your renovations be planned! Winning Gold for decorating a 398 square foot micro-suite. An important professional challenge of mine earlier this year was figuring out how to decorate and furnish a 398 square foot show suite inside a new development in Surrey, BC. I was hired by the developer’s marketing company to decorate and set up a display suite for their micro-suite. They wanted to show a small space with maximum style for maximum affordability. My purpose in staging the 398 sq ft display suite was to show potential buyers how they could have a complete living space within a single 398 square foot room. My reward at the end of that exciting and challenging process was winning the Gold Award for decorating a 398 square foot micro-suite through the Decorators and Designers Association of Canada (formerly CDECA). CDECA is a national organization of accredited interior decorators and their Decorating and Design Competition’s awards luncheon was held in Toronto on April 14, 2014. I was able to fly to Toronto to attend the ceremony and receive my gold award from a representative of the “Homestaging” category’s sponsor, Speers Flooring. Receiving design award from award sponsor Speers Flooring representative. It took about three months to plan, connect with local vendors, source furniture, and implement my idea in order to show potential future homeowners that they could have their bedroom, living space, dining table, workspace and kitchen all in one room. No “small” task! My style idea for the suite involved an overall neutral palette of white and grey with trendy shades of turquoise and orange as accent colours. The geometric pattern wallpaper in a darker grey colour helps to define the living area and is a great backdrop for the neutral coloured apartment sized sofa from IKEA. I’m proud to say this small space was furnished and styled within the real estate developer’s budget, which was under $12,000. Instant Bedrooms wall bed ~ Queen bed or table. I sourced the living area furniture and accessories at Ikea, Crate and Barrel, and CB2. The awesome multi-functional wall bed and drop down table combination is made by Instant Bedrooms Manufacturing in Yaletown. I’m very excited to have won this award as all the winners in the competition were selected by my peers in the organization and I’m proud of my achievement in a profession that I love. I’m also excited to be able to use my experience winning this award to highlight that people can have affordable and stylish design, including hiring a professional such as myself, without having to pay a fortune. Style doesn’t have to break the bank to be good! If you would like to know more about this project or if you would like to create a new look for a room in your home, connect with me here. All rights reserved 2017, Urban Aesthetics.